65,000 people work at Schiphol, which is about 4x the capacity of a large concert hall! We employ people in all kinds of professions – shop clerks, cleaners, flight attendants, pilots and more. There are many other different jobs at Schiphol that you may never have heard of, or wouldn’t expect there to be. Firefighters have a cool and important job at our airport. We have our own fire brigade with 3 buildings, which are also known as the barracks. 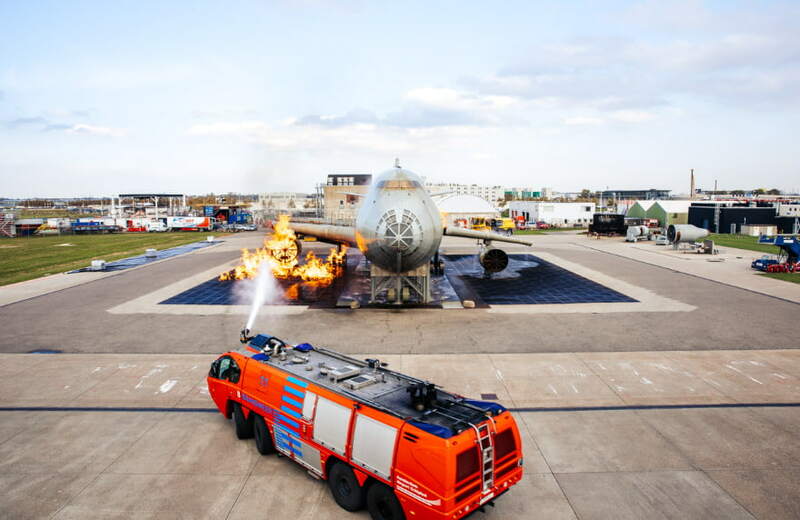 Since the runways are quite far away from the terminals, we have 3 barracks at various locations around the airport so the fire services can be at the top of the runway within 3 minutes. They do relays every day to ensure they are always able to make that 3-minute mark. All aircraft arriving at Schiphol have to be parked in the right spot. Most parking spaces at our airport have an automatic system that allows the pilot to easily park the plane. If there’s a problem, a marshaller will guide the pilot to the aircraft’s assigned parking space. They signal the pilot using 2 orange signs or luminous sticks, and let them know whether the aircraft should be slightly more to the left or right, or when the plane has to come to a standstill. There are international agreements about the use of the signals, so you could say it is a universal language. That means whether the pilot is French, Russian or American, they’ll all understand what the marshaller wants them to do. It is dangerous to have birds flying around aircraft because they can end up in the engines. If that happens, the plane must land and be completely examined for signs of damage. Schiphol employs bird controllers to ensure flight safety. Their job is to scare away the birds around the airport. You can recognise them driving around in their bright yellow cars with speakers on the roof and a bird painted on the car bonnet. Birds controllers use different methods to scare birds away like playing angry bird sounds, so that the birds think that there is danger. Otherwise they fire a shot with a signal gun to scare them away. Our bird controllers are there to ensure your safety. Floor managers walk around the terminals within Schiphol. The terminals are the buildings from which you depart and arrive. Floor managers can help you find your way, or answer any questions you may have. They can also help if you cannot find your way around. Furthermore, floor managers monitor safety if it gets too busy within the terminals. In that way, it is important that large groups of travellers do not stand in front of the doors and block the exits, in case people need to leave quickly. Floor managers are also called for first aid for travellers. Whatever the case may be, our floor managers will be there for you in Schiphol’s terminal.